Grass eaters, meat eaters, pads, bagmen, scores, and doing doors. These are a few of the nicknames cops in the New York City Police Department use for their colleagues engaged in the business of committing crime. It’s no wonder these words have become part of the NYPD lexicon, considering its long history of corruption. Patrick Lynch, the head of the Patrolmen’s Benevolent Association, is attempting to use the senseless murder of two NYPD officers as the basis for irrational rants and calls to impose “wartime” measures on the citizens. But the more rational among us know that unprovoked murder is absolutely wrong and is rejected by those protesting police brutality. Awareness of police brutality and corruption is growing exponentially, and, as you will see below, excessive force has risen dramatically in the NYPD since 1993. It should come as no surprise to authorities that people are showing their frustration through peaceful yet powerful protests. It might make Mr. Lynch uncomfortable to know that the NYPD practically wrote the book on police corruption. In 1993 a permanent Internal Affairs Bureau (IAB) was set up to ferret out corruption. 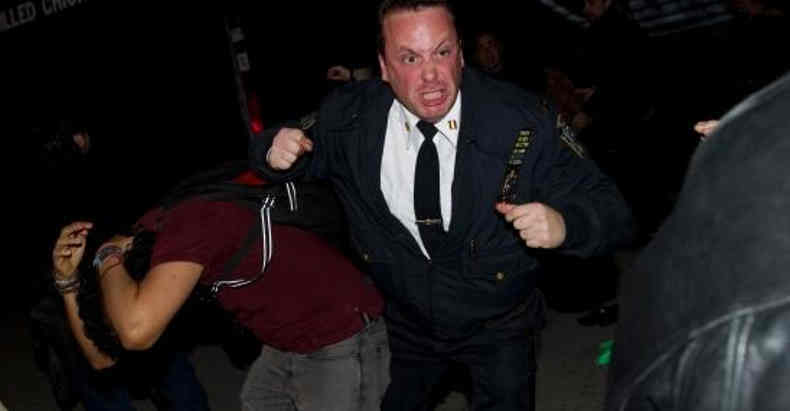 Known as the “rat squad” by NYPD cops, it relies heavily on cops snitching on other cops. The IAB is normally shrouded in secrecy, but the New York Civil Liberties Union (NYCLU) managed to acquire 16 years of IAB reports through the Freedom of Information Law. Although the NYCLU study was performed in 2010, it is perhaps the best data we have of recent NYPD corruption. The most striking fact is that the use of excessive force rose dramatically during those 16 years. There is no reason to believe this statistic has reversed its trend. The Free Thought Project documents badge abuse on a regular basis. To top it off, the reports released to the NYCLU were missing 47 pages, purportedly to protect current or future investigations. Here’s another troubling finding from the study. All of this points to a declining interest in confronting the culture of corruption that has persisted in the NYPD for more than a century. The Mollen Commission may have provided some temporary motivation, but that rapidly deflated as the years went by. Instead of blaming protesters for the senseless actions of a deranged man, Mr. Lynch and associates should devote their energies to confronting the brutality and corruption plaguing their own men in blue.